Get your lunch delivered free with MyFreeDelivery.com! 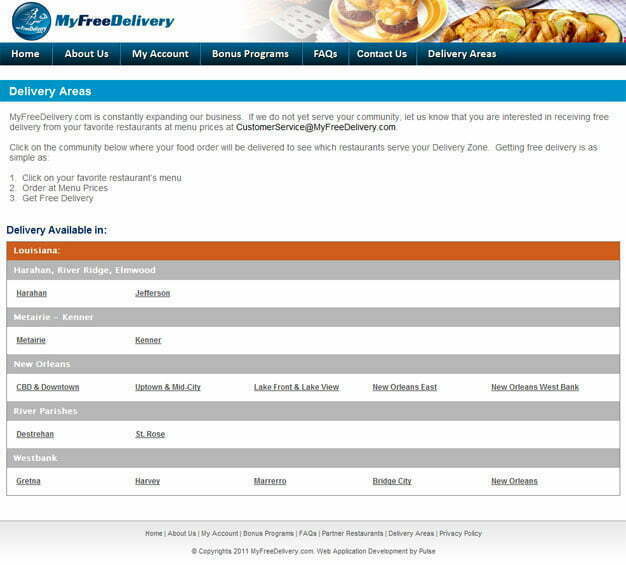 MyFreeDelivery.com started in New Orleans, Louisiana – the food capital of America. MyFreeDelivery.com makes meetings and lunch easy and CONVENIENT FOR YOU. There is no longer a need to be frantic over getting group office meals or skipping lunch because you are too busy with that deadline project, or parking is a nightmare or inclement weather. MyFreeDelivery.com takes the hassle out of meal ordering. Period! Ordering is easy. Pulse Solutions was contracted to build the application that would automate the complete process making it seamless for users to order and restaurants to process the orders. The system builds a weekly schedule for restaurants so that users know what restaurant they can order from on which day of the week. The software tracks security levels and allows for out of turn ordering for bulk orders as well. Restaurants have complete control over their menus at all times and changes can be made live from the restaurant console. The menu building engine is a masterpiece by itself and the technology employed makes ordering an enjoyable experience. The design of the website needed to be clean, clear without any extra frills to ensure the message is transferred to the user as quickly as possible. The website simply offers what many have been looking for; free and easy food delivery and they do it by bringing people and restaurants together. The software was built using ASP.Net 4.0 and MS SQL 2008 using MVC architecture and extensive usage of AJAX enabled technologies.